WHEN DID YOU ACTUALLY OVULATE? To see why this question is so important, it might be helpful to review the two basic halves of the menstrual cycle: the Follicular Phase and the Luteal Phase. The Follicular Phase is the first half of your cycle. It starts on the first day of your period and ends when your body releases an egg during ovulation. Your Luteal Phase starts after ovulation until the first day of your next period arrives. The Luteal Phase is supported and maintained by the release of progesterone. Here&apos;s the important part: your Follicular Phase can vary in length. Meaning, just because you ovulated on Day 16 last cycle does NOT mean you will always ovulate on Day 16. It&apos;s perfectly normal to experience different days for ovulation from cycle to cycle. Your body can delay or even suppress ovulation due to stress, hormonal imbalances, medications, or other causes. (When I first started taking Vitex, I once ovulated as early as Day 9!) What this means is that the overall length of your average cycles is not sufficient enough to say that your period is late. Your average cycle length may be 28 days; the current cycle may be 33. This does not automatically mean that you are pregnant or that there is something "wrong" with your body. Actually, it&apos;s virtually impossible to know if it means anything at all unless you&apos;re charting your cycles. 1) You get your period and your temperatures drop down again. 2) You don&apos;t get your period, your temperatures remain high, and you get a positive pregnancy test. So let&apos;s look at a plausible scenario. Lucy usually has 28 day cycles. Her average luteal phase length is 12 days. In her current cycle, she confirmed ovulation on day 20. On what cycle day is her next period due? Yep--you guessed it. (Or you did the maths. Whatever.) Cycle Day 32. 20 + 12 = 32. Since Lucy knows she ovulated late, she also knows her luteal phase will start and end later. Thus, no freaking out, crying, hair pulling, wailing, or gnashing of teeth will occur when she tries to take a pregnancy test earlier than is possible to register a pregnancy. For most women, knowing your exact date of ovulation would probably solve the mystery. The majority of women don&apos;t usually know the exact date unless they&apos;ve been charting and recording their fertility signs. Even with the use of OPK&apos;s, the best case scenario is that they have a range of 2-3 days in which ovulation could have occurred. TL;DR: Unless you know the date of ovulation, you don&apos;t know if your period is truly "late" or not. I know, I know...you want to know if you're pregnant as soon as humanly possible. Let's talk about when that would be. 1 DPO (Day Past Ovulation): The egg hangs out in the fallopian tubes and waits to be fertilized. If fertilization occurs, the egg starts moving down the fallopian tubes toward the uterus to implant there. This is a process that usually takes anywhere from 3-5 days. 3-5 DPO: The egg (now a bundle of cells called a morula) reaches the uterus and starts to burrow deep into the endometrial lining. 7-10 DPO: Implantation is complete. The morula has graduated to a blastocyst and is officially connected to the mother's blood supply and nutrients. It starts to produce hCG, which tells the body to sustain the pregnancy. The hCG levels will double every 2-3 days after implantation. This means that the earliest you could see a positive on an HPT (Home Pregnancy Test) would be around 10 DPO. 10-12 DPO: By this point, the blastocyst has produced enough hCG that it should produce at least a faint second line. Keep in mind, though, that it may not show up until closer to 12 DPO, depending on when implantation was complete. So let's do another hypothetical scenario, using Lucy's cycle dates from the last section. She usually has 28 day cycles, and she had confirmed ovulation on CD20. She hasn't gotten her period by CD29, so she figures her period is late and takes a home pregnancy test. It comes back negative, but she still doesn't get her period for another four days. Why? The answer: it may be too early to tell if she's pregnant or not. Since she knows she ovulated on CD20, she is only at 9 DPO on CD29. It's simply too early for an HPT to register any signs of pregnancy. She doesn't get her period until her luteal phase is over, and the average length of her luteal phase is 12 days. At 9 DPO, she's also on day 9 of her luteal phase, meaning she shouldn't expect her period until four days later, on CD 32. Here's the TL;DR for this section: If you know your date of ovulation, testing before 10 DPO will probably yield a negative pregnancy test, even if you are in fact pregnant. Waiting until 12 DPO should give you a definite positive if you are pregnant. CLC's, CYSTS, & PCOS, OH MY! As I said in the previous section, your luteal phase is ended by 1) your period or 2) a pregnancy. In rare cases, there may actually be something else going on that ends up in neither category. I'll go over them briefly here, but in order to diagnose or treat these conditions you would need to see an infertility specialist or doctor. Corpus Luteum Cyst: this can happen after your body ovulates and releases the egg. The luteal phase is sustained by the corpus luteum, the remnant of the egg-containing follicle in your ovary. It secretes progesterone, eventually disintegrating at the end of your luteal phase. When it ceases producing progesterone, you get your next period. If you have a corpus luteum cyst, you may see a longer-than-average luteal phase length, with definitive negative pregnancy tests even after 12 DPO. (There's no hCG being produced, and thus, no positive pregnancy test--even though your period hasn't arrived.) If you suspect you may have a CLC, you will need to work with a medical professional who specializes in fertility treatments. LUFS: LUFS stands for Luteinizing Unruptured Follicle Syndrome. Basically, your ovaries develop a follicle that is supposed to release an egg, but it never does. This means that, for all intents and purposes, your body thinks the egg has been released. 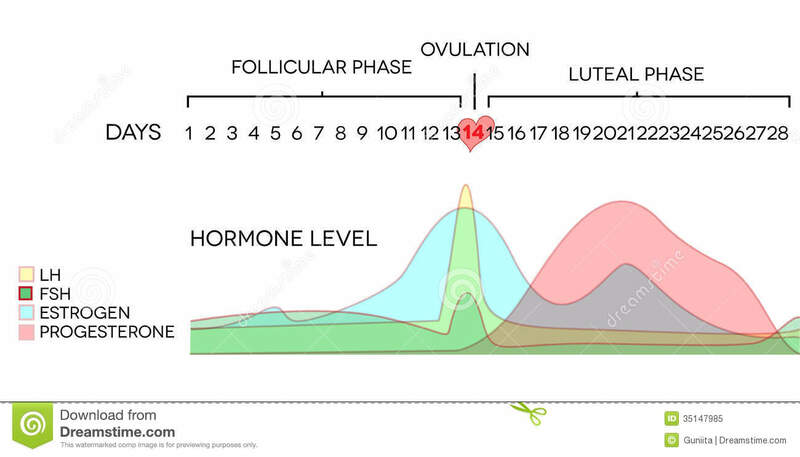 You get a normal ovulatory pattern and your luteal phase remains the same. Or, in some cases, it actually lengthens--which can be very confusing for women who are trying to conceive. You might see longer-than-average luteal phase lengths, but are still getting negative pregnancy tests. As I said earlier, this is not something you can usually diagnose just from charting--you need to see a medical professional who can do ultrasounds around ovulation and check for any abnormalities. PCOS: PCOS, or Poly Cystic Ovarian Syndrome, is exactly what it sounds like. One or more cysts can end up growing on your ovaries, resulting in hormonal imbalances, irregular cycles (including irregular luteal phases), and difficulty conceiving. Due to the fluctuating nature of PCOS, it can be incredibly difficult to pinpoint ovulation. Not to mention, many women who suffer from PCOS go for long stretches of time without ovulating at all. Some have 40, 50, or even 90 day cycles. There are ways to help manage PCOS and its symptoms, both medically and holistically. Start with a reputable website or book and do whatever works best for you. Many women have found success in changing their diet, addressing hormonal deficiencies, exercising, using medication, or consulting with a fertility doctor. ARE YOU TESTING TOO EARLY? SO...AM I PREGNANT OR WHAT??? As is often the case with fertility, the answer is usually, "wait and see." Knowing your ovulation date, average luteal phase length, and health of your cycle in general can answer this question 90% of the time, and give you confidence in what's actually happening in your body for the other 10%. Hopefully this has helped clear up some of the confusion around late periods and negative tests. If there's anything I missed, be sure to leave a comment below!